Note As of 07/2014, this is being worked on via Initializing Nasal early - there are still some issues that need to be solved first, specifically related to making most subsystems optional and fully runtime-configurable using listeners and "property signals" so that SGSubsystems can be dynamically allocated - see Howto:Reset/re-init Troubleshooting and FlightGear Run Levels for further details. See also Read canvas image by HTTP. if we wanted to build a tablet-based emulator ourselves, we could at least join forces with the FSX and X-Plane communities to do it to grow up the pool of talent. Should there maybe be a separate project to build an embeddable GPS navigator with different faces/UIs (and a default standalone front end)? As others have mentioned, a lot of the backend logic is the same, like doing a gradual transition from RNAV to Localiser on intercept to avoid a sudden jolt in the A/P, or calculating a turn past a fly-by waypoint. Again, that would be a way to join forces with other Sim dev communities. If we want to remove an subsystem from the flight gear source code, without leaving any trace of it.. What are the essential steps ? (for example, if the sound update has to be removed, what are steps to be followed). — Divi (Aug 31st, 2015). 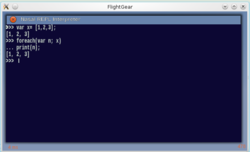 Steps for Removing subsystems in flightgear source code. — hamzaalloush (Thu Apr 02). Simgear-based subsystem with Canvas support?. I am looking for a simple environment to be able to display canvas elements without starting the whole fg and wait a long long time. Does it exists ? Is there any way to do it, do you have any clue ? — Jean-Yves LEBLEU (2014-01-06). [Flightgear-devel] canvas test environment. Creating a 'fgcanvas' client analogous to 'FGPanel' should be doable too, since the canvas simply renders to a single osg-Camera. Unlike fgpanel this will require OSG instead of raw GL of course, but that's the price we pay for unifying the rendering backend. If we're rendering each display as an OSG sub-camera, extracting that logic and wrapping it in a stand-alone OSG viewer should be simplicity itself - and so long as it's driven by properties, those can be sent over a socket. That's an approach which seems a lot more bearable to me than sending per-frame pixel surfaces over shared memory or sockets / pipes. So, can I run flightgear on my RPi? Under what OS are you working on the Pi? — Markus Wanner (2013-09-11). Re: [Flightgear-devel] portability of simgear. more useful would be to get ARM working so we can run parts of the stack on Pis, Pandaboards and so on. This would be materially useful for various add-on functions, especially the canvas and fgcom. — James Turner (2013-09-09). Re: [Flightgear-devel] portability of simgear. Note we can't run FG itself without major work, since these platforms only support GLES1 or GLES2, and there's many legacy areas of the renderer which would not work. — James Turner (2013-09-13). Re: [Flightgear-devel] portability of simgear. In general, we still have very few Canvas-based instruments. The majority of "glass" instruments are still hard-coded, i.e. implemented in C++ space. Such instruments are also not supported by fgpanel. FGPanel really only supports classic 2D panels that are built using stacked textures. Anything more sophisticated than that (e.g. a NavDisplay) will require a hard-coded instrument, or Canvas - both of which are unsupported by fgpanel. This would then also make FGPanel obsolete, because we're hoping to unify the 2D rendering back-end using Canvas, i.e. by implementing a 2D panels parser via Nasa/Canvas. However, there are still several things that need to happen for this to become feasible - currently, it seems this is at least another 3-4 releases away (i.e. 2+ years). Obviously, this assumption is based on the manpower currently available, and people interested in helping with this. For the time being, there are 3 core developers working towards this and a number of other contributors willing to help to get this done. Realistically, we could accomplish many things already - and if someone is interested in pursuing this, we can provide a ton of pointers and also help to varying degrees. — Hooray (Sun Jun 15). Re: Instruments for homecockpit panel..
it would even be possible to use built-in FG dialogs in an external window, running in a standalone process - e.g. for an instructor console, but also for a Canvas-driven TerraGear GUI. — Hooray (Mon Jul 07). Re: How can I retire from the forum?. We've been talking about having a FGCanvas mode built right into the fgfs binary at some point, analogous to how FGPanel works - just as an integrated part of the main code base, while not only supporting 2D panels, but also MFD-style cockpits and even GUI elements. Realistically, it is only feasible to support such use-cases by having a single common backend that knows how to deal with multiple windows, rendering contexts, GPUs or multiple fgfs instances. Basically, FGCanvas is going to be just FlightGear, in a custom startup mode, to make certain features and subsystems optional, so that the runtime footprint is reduced over a conventional full fgfs instance, and computing resources freed. While FGPanel is great, it's a separate code base, and as such needs to be maintained separately, it also isn't as flexible - and cannot be scripted or used for glass avionics, it also doesn't support any of the existing hardcoded displays - so it's stricly about 2D panels and static/property-driven transformations. At the moment, there are a handful systems/features in FG that need to be disabled manually, and others that cannot be disabled at all. Which is why you'll currently either need a fairly powerful computer, or use a workaround. The hope is to make OpenGC/fggc and some related things obsolete, since the same XML+Nasal can be used in the main sim or stand-alone. 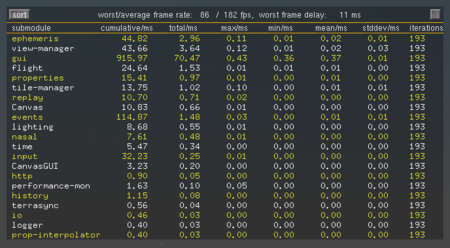 Screen shot showing a the performance monitor in a patched version of FlightGear 3.2 where subsystem initialization is made better configurable and increasingly optional by allowing subsystems to be explicitly disabled/enabled during startup. Decoupling internal subsystem dependencies means that we can more easily provide support for benchmarking, but also headless regression testing - and eventually, also a standalone FGCanvas startup mode. Otherwise, it's mostly Nasal code in $FG_ROOT/Nasal where dependencies need to be better established and formalized to get rid of implicit assumptions regarding availability of certain subsystems (e.g. view.nas). Also see Initializing Nasal early. what we're calling "FGCanvas" will be FlightGear minus a number of subsystems - i.e. a subset of FlightGear. But you will start FlightGear twice: once in "FlightGear mode" and once in a subset of it, which we call "FGCanvas" - the 2nd instance can also be running on a different computer/network obviously. It's been shown that roughly ~60-70% of the subsystems in FlightGear would not be required for FGCanvas - so, those would be explicitly disabled for the FGCanvas mode. Which also means that the hardware requirements will be much lower. Basically, you can imagine it like 1) osg, 2) canvas and 3) Nasal - even though there are a handful of additional dependencies required. But otherwise, that's basically what FGCanvas is all about. — Hooray (Mon Jul 21). Re: Need to Create a Standalone PFD. Which means that you can run Nasal, but also I/O protocols - because all the FlightGear infrastructure would be -optionally- available. To get this going quickly, you can just comment out unneeded stuff (e.g. sound, fdm/flight etc). Even though a more proper solution would be using properties to exclude subsystems optionally. It has been suggested that this article or section be merged into Canvas and OpenGL ES. 1) Should be able to listen to Socket in which Flight Parameters like Pitch, Roll, Altitude etc(published by another system) are available. 2) Use the parameters to show a 2D Graphics of Primary Flight Display with Artificial Horizon, Pitch Ladder, Bank Angle indicator etc..
Is it possible for me to develop such Standalone PFD using Canvas Framework?? If not which will be a good platform to do the same. It should run in Linux Operating system. — deena102 (Fri Jul 18). Need to Create a Standalone PFD. — Hooray (Mon Jul 15). Re: How do I make a 2D . hard-coded instruments like the existing PFD/ND stuff cannot be easily set up to support multi-instance setups. Aircraft using canvas-based instruments can be more easily prepared to support such use-cases, but may still require a few C++ tweaks. This is something that we're hoping to support sooner or later, probably by supporting an osgviewer viewer for multiple windows, but also by allow canvases to be referenced/driven by different fgfs instances eventually. For the time being, the necessary steps are unfortunately aircraft specific, because existing solutions are not particularly consistent, but rather fragile still. This is likely to change during the next 2-3 release cycles, because we're also hoping to support a standalone canvas startup mode, that would allow any canvas-based instrument to be rendered and slaved to another instance. — Hooray (Sat Apr 05). Re: Displaying Cockpit Instrument display on multiple screen. The canvas allows you to use SVG images drawn with Inkscape, and easily use raster images and custom drawing commands using OpenVG paths. However, please do note that the canvas cannot currently be run in a standalone/FGPanel-fashion - there's been some talk about that, but that will at least take another 1-2 releases in my opinion. That being said, you could certainly come up with a canvas instrument panel, and then simply use in a dedicated fgfs instance, which is slaved to a corresonding master instance. — Hooray (Sat Jul 13). Re: How do I make a 2D PFD with pages. By using a Nasal/Canvas-based framework, you can also easily reuse existing instruments/textures available in FlightGear (ADF, RMI, HSI etc), including various 2D instruments - it's just a matter of some scripting. Note that FGPanel is fairly limited feature-wise, it doesn't support any of the hard-coded displays (TCAS, AGRADAR, WXRADAR, NavDisplay) or other owner-drawn gauges, it's stricly for static textures animated through properties. — saul (Thu Jul 31). 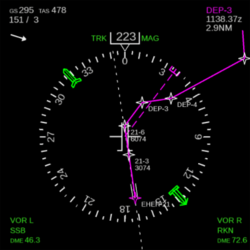 Re: Flightgear Android Primary Flight Displays for Airliners. you should be aware of glass cockpit related efforts, especially Canvas - most airliners & jets will sooner or later benefit from being ported to Canvas, e.g. to use Gijs' NavDisplay framework, or at least Philosopher's MapStructure framework for mapping purposes. I am involved in both, the NavDisplay and MapStructure efforts, and my mid-term plan involves supporting a standalone mode for all Canvas-based glass instruments, including the ND, but also other instruments like the PFD, EICAS, CDU or EFB. This may sound like a lot of work, but it's mainlyy a matter of introducing a a few helper classes and ensuring that people actually adopt and use those. In the long-term, I really want to support distributed FlightGear setups like those at FSWeekend/LinuxTag, where multiple computers may be used to run a single simulator session - including properly synchronized glass instruments like the PFD/ND etc. This would also help improve the multiplayer experience, especially dual-pilot setups etc. — Hooray (Sat Jun 07). Re: computer2cockpit. There's also the long-term plan to eventually port FGPanel back into FG and come up with some sort of "FGCanvas" mode, where Canvas-based displays could be run in a separate "standalone" mode and interface to the main/master FG instance. In general, it pays off to unify things - otherwise, there's lots of duplication and re-invention involved. — Hooray (Tue Jan 28). Canvas & OpenGL ES (Rasberry PI, Android etc). it would make sense to coordinate such efforts, because the requirements will be very similar. The Canvas is a property tree-based subsystem using listeners, the canvas is primarily a wrapper on top of Shiva and OSG that is invoked via listeners. So all the OpenGL code is either located in Shiva or in OSG - OSG can be told to use OpenGL ES. So it would be a matter of experimenting with it. For this particular project, I would suggest to extract the Canvas into a standalone executable - something like this has been previously done by TorstenD when he came up with FGPanel, he "just" extracted FlightGear's 2D panel code and turned it into a standalone binary. This alone would help us ensure that we can optimize the canvas to support OpenGL ES - once that is working, you could cross-compile the standalone canvas binary. — Hooray (Fri Jan 31). Re: TQ/Panel for FG made with Kivy. This should give you a rough idea on what's involved in extracting the canvas system into a separate code base, to cross-compile it for other devices. 40-60% of this are already done inside FGPanel and FGRadar - so the first weekend will be primarily spent doing "copy & paste". If you are interested in working on this, you should obviously know some C++ and you should be able to build from source. If that's not a problem, I suggest to raise the question in the canvas forum, so that TheTom can provide some more informed input. It would definitely be a useful project, not just for Rasberry PI support, but for FG itself - because the whole FGPanel/FGCanvas idea is generally agreed to be useful, so any work related to this would be highly appreciated, and we're here to help you accordingly. — Curtis Olson (Jan 10th, 2016). Re: [Flightgear-devel] FGPanel on the Raspberry Pi. Using the Pi as an avionics platform has been on my todo list for a while - I've had a box full of parts just waiting. A 7" HDMI display with a touch screen overlay for it. — geneb (Jan 10th, 2016). Re: [Flightgear-devel] FGPanel on the Raspberry Pi. — TheTom (Fri Jan 31). Re: Canvas & OpenGL ES (Rasberry PI, Android etc). I've just seen that the Raspberry Pi has hardware accelerated OpenVG support, so we won't need ShivaVG and the path rendering should be quite efficient. Right, not only is OpenVG natively supported in hardware, but there's even a vector font library available named "vgfont". — Hooray (Fri Jan 31). Re: Canvas & OpenGL ES (Rasberry PI, Android etc). FlightGear's canvas instruments are completely different from HTML5/Canvas, FlightGear's Canvas uses OpenGL/OSG and provides full hardware acceleration - so there's really no direct advantage when it comes to reusing FG's canvas instruments in some form of browser-based cockpit view. Your best bet still is FGPanel or the FGCanvas effort (which is really just going to be FG in a down-stripped runtime mode, nothing more). To render glass cockpits in some separate program, you would need to use the canvas system available in SimGear - which is exactly what the FGCanvas idea is all about, just as part of the main fgfs code base. However, you could create a PFD or ND in a browser using HTML5/Canvas - you would just need very little data out of FG, so there's no problem here - but you would basically be recreating things, there's no sane way to reuse existing FG resources here. So, as someone familiar with most recent glass cockpit developments using the Canvas, I would suggest to either abandon the idea of using FG/Canvas instruments, or look into required changes for supporting FGCanvas, analogous to FGPanel. But ultimately, that still means that you'll need OpenGL to run things. — Hooray (Sat Dec 21). Re: Virtual Panel/Control from Web Browser. Hooray: "Regarding Torsten's fgpanel work, it would be good to eventually generalize this in such a fashion, that "canvas" instruments could also be rendered standalone at some point." Hooray: "Unfortunately, there are many hard coded assumptions in the code currently. The code OFTEN assumes that there's a an aircraft, FDM scenery, sound etc. Basically, all the stuff that won't be needed by a standalone FGCanvas/FGPanel. And the next funny thing is that all the Nasal code in $FG_ROOT/Nasal is also making lots of these implicit design assumptions (such as geodinfo() calls (depending on scenery/tile mgr) etc). Basically, this means that there will be lots of refactoring involved for a standalone canvas client, not just C++ code, but also Nasal code." TheTom: "Yeah, the stand alone mode won't be to easy. Maybe for now we should use a powerful enough computer which can also run the unneeded parts Separating the parts will be very important, not only for FGCanvas..."
Some more ideas have been collected here: SGModule - standalone SGSubsystems. Also see: Howto:Creating fullscreen Canvas applications. Also see FlightGear CIGI Support (Common Image Generator Interface). I've always wondered what would be involved in adopting HLA. Could we start using it today, i.e. for a very small proof of concept? Do we need an implementation? Who would be able to do it? What does the code already in SimGear do? A little message passing doesn't sound like a bad idea to me, if I understand it right. — Philosopher (Tue Jul 08). Re: FGCanvas Experiments & Updates. I think even just preparing the SimGear code for this would make sense, the canvas system would have a simple and elegant solution for "aliased" properties with listeners - i.e. where properties may be looked up using different criteria (by-index, by-name). And for the whole FGPanel/FGCanvas idea, this will definitely be useful - because it's all about allowing two property trees to communicate with each other. In other words, if we had an option to link properties and "mount" them in some custom location, then it would also be easy to handle the FGCanvas idea such that it always writes to the local fgfs property tree, which is transparently forwarded to the right end point, i.e. the standalone FGCanvas instance. Currently, in FGPanel, this is handled separately and there's no elegant design or solution at all. The network protocol must be separately set up using an XML/IO protocol file, which duplicates properties from the main instance to the "slave" instance, i.e. explicit networking I/O. Now if we had a feature to supporting "linking" or mounting, then this could later on be extended such that custom "transport" channels can be added, i.e. IPC via sockets (e.g. some simple form of reliable UDP using the multiplayer code in FG for the basic property primitives like int, float, double, string)- for FGCanvas that would mean, that all Nasal modules would only ever write to their local property tree instance, and that they don't need to be aware of the differences or the transport technique used. I think the Nasal code could be really kept simple like this, because there would never be a different between a "local" or a "remote" FGCanvas instrument - so no explicit maintenance required. Would something like this work for your C130J EICAS or MCDU work, I mean such that all the communications details are handled transparently by a network-enabled property tree with "link/mount" support, so that it would be trivial to run an instrument separately, in a different process - on a different computer, just by writing to a mounted remote property tree? One would just have to decide on which instance of FG the calculations of the ECIAS and other displays should take place, but with full mounting support this should be easily distributable as computing power is available. Yes, that's true ... on the other hand, even if we should be able to run the Canvas system standalone via FGCanvas one day, it would still just be a "display" - i.e. full scripting support would be in a different league, because it would require an embedded Nasal interpreter. So many scripted calculations would initially take place in the main fgfs process, and FGCanvas would "just" display the results via some form of mounted "remote property tree", so that the main fgfs process just writes to a certain location which is transparenly sync'ed/mirrored to another "slave" fgfs process, where the canvas would be rendered. By default, I would expect that the various canvas Nasal wrappers just write to the main fgfs property tree directly, which is then transparently forwarded to another process - so everything in scripting space, would still be calculated in the fgfs main loop, while all canvas-related computations triggered via listeners, would then be "distributed", i.e. run in the "delegate" process - because that's where the callbacks would be invoked. A while ago, I played around with showing canvas instruments in a slaved fgfs instance - and it actually worked pretty well just by using the existing telnet interface, the subscribe command and 20 lines of Nasal to fix up property path index numbers, while the telnet protocol isn't very fast - it was sufficient to show the airport selection map in a slave instance, as a cockpit texture - without any C++ changes. We once had a long discussion about necessary changes to "mount" remote property trees in a local property tree to replicate state - but the experiment showed that even a crude synchronization mechanism like the props protocol works well-enough for a single instrument. In summary, we really need to make sure that whatever form of caching/optimizations are introduced, that they can work in master/slave setups, and that is automatically the case as long as the property tree is the sole storage and transport mechanism, so if there is some form of cache, it needs to be local and transparent to the property tree - so that slaved instances get their chance to update their local cache, rather than cross-referencing cached items in multiple interlinked instances. While it may not seem important right now, because most other simulator features are similarly broken or "crippled", the canvas system is the most feasible chance to address these once and for all. ↑ David Megginson (Jul 5th, 2017). Re: [Flightgear-devel] RFD: FlightGear and the changing state of air navigation . ↑ Hooray (Oct 15th, 2016). Re: Canvas remote drawing . This page was last modified on 16 July 2017, at 14:20.